With its turbulent history of innovation, collaboration and conflict, the 58-year-old Newport Folk Festival is as American as they come. From Pete Seeger to Bob Dylan to Janis Joplin to Beck and My Morning Jacket, the annual island-bound celebration of roots music has done more than just launch careers—it has helped define a culture, from what “folk music” actually is to who gets to play it and who gets to sell it. In I Got a Song, which is out this week via Wesleyan University Press, Massimo juggles the decades of triumphs, struggles and personalities with aplomb, building a foundation on years of research and first-hand encounters as a longtime festival correspondent for the Providence Journal, and supplementing them with dozens of interviews with performers, fans and organizers. Among the many voices in the book is that of Jay Sweet, a former journalist who assumed the role of Newport Folk’s Executive Producer in 2008. Paste Magazine sat down with Massimo and Sweet in our New York Studio recently to talk about the past, present and future of the Newport Folk Festival. What follows is an edited version of that conversation. Paste: At one point in I Got a Song, a 90-year-old Pete Seeger introduces “This Land Is Your Land” at the 2009 festival by saying it was a song that had never been on the radio and had never been sold in a music store. It seemed like he was drawing a distinction between the kind of music that was initially presented at Newport in the late ‘50s and the artists on the bill in 2009, who were more commercially oriented, more pop oriented. Is it safe to say that the Newport Folk Festival has existed in something of an existential crisis for most of its history? Paste: So where folk music in Seeger’s heyday was about spotlighting the music of certain communities, ethnic groups, immigrant groups, the music of the people, nowadays is that a good definition of what folk music can be in terms of how it is talked about electronically? Is that the same thing that Seeger was doing in his day—bringing new songs to people who may not have heard them? Rick Massimo: I feel like it is. I feel like as soon as electricity is involved somebody is going to say that it’s not folk, and that it’s not a folk process. I don’t know that you can say that anymore. Electricity has been involved for a very long time. The music that we’re talking about now may not be as much about indigenous music as Pete Seeger was talking about, but it’s still music that wouldn’t necessarily be disseminated any other way. You know, when I think of the word “pop” or “radio,” I don’t know how many more acts there are at the Newport Festival now that are radio stars than there ever were before. They’re popular, but they’re not disseminated in that pop way of radio and selling millions of records. Some of them obviously are, but, offhand, I don’t think it’s suddenly this pop-chart kind of festival. Paste: Jay, does the idea of what folk music is or is not or might be have any role in how you conceive the festival and how you program it? Jay Sweet: It’s the only role. There are definitely artists that wouldn’t fit into my definition of what is Newport folk at the moment. To me, there’s a distinction. Other people can have a folk festival, and there are some great ones out there. The one that I work with and my team, we determine in that given year what we feel is the next chapter in an obviously storied history of what we deem to be Newport Folk. We take that term a little bit broadly. You have to remember that the Avett Brothers when I booked the Avett Brothers weren’t the Avett Brothers that played Madison Square Garden. They weren’t even close to that. So, my point is, when Seeger was saying that “This Land Is Your Land” wasn’t on the radio, it wasn’t on TV, he had to bring it to the people. People had to learn it by being with other people. When we decide to book artists, there’s always a portion of, how can we give a leg up to a band that is, say, from Louisiana, and doesn’t have much of a draw outside of Louisiana? Well, let’s bring them up to the Northeast, which is following a little bit of the blueprint that Pete, Alan Lomax and a lot of these guys did. Paste: So do you see a lot of parallels in the way that you program this festival with the way it was programmed in its early days, in terms of the function of the festival or the relationship between the music and audience? Is there a throughline? Paste: Nowadays, Coachella is huge. Bonnarooo is huge. New York City now is going to have three massive rock festivals this year, and that is new for this region. Newport was, for many years, the going concern in this part of the country as it grew. Do you put pressure on yourself to operate on that playing field along with these massive, big-money festivals? Jay Sweet: It’s funny because I was just at a conference talking about this with the people who run those festivals, and it was amazing to me that in everything they said was, “And then there’s also Newport, which is this outlier. We’re doing this, and then there’s this little tiny speck. It’s the furthest planet away from the Sun—that’s Newport.” Some said that, and some also said, which is also true, a parallel truth, is “Without Newport, none of us are doing this.” So, while it’s the outlier, it’s also the original. Jim James of My Morning Jacket performs at the 2015 Newport Folk Festival. Paste: What in their minds makes it an outlier? Rick Massimo: One thing that makes it an outlier is that, first of all, it has the decades of history. It’s also on a peninsula on an island in the smallest state in the union. The biggest little state in the union. Jay Sweet: Yes. All the roadie people out there, sorry. Rick Massimo: So, 10,000 people is it. Jim Sweet: And we’re talking about these mega festivals that are 80,000 people. We don’t have a marketing budget. We don’t do any press releases. No press releases, no marketing, and we sell out before we announce the artists. Year by year we announce fewer and fewer artists, which I think the other people in the festival world find a little bit confusing. At this point last year, 15 percent to 20 percent of the artists weren’t announced, and this year there will probably be a little bit more that are not announced. Some of it’s done because we feel that’s the right way to do it for this particular festival but, honestly, every other festival does it where they’ll throw out the lineup and wait to build up buzz, then they’ll put the tickets on sale, then they’ll market and then they’ll do all these press releases. We operate at the generosity of the people that understand the historical significance of why keeping something like Newport around is important, because it does tie us to the original festival, and it’s still alive today. I think that’s an important thing. Paste: It almost died a time or two. It was out of commission from 1970 to 1985. It has gone through these periods where it may not have been able to present itself in its optimal form and found that shutting down was the best thing to do, notably after the huge outdoor festivals of the late 1960s. What was it like in the late ‘60s when Newport went quiet? Rick Massimo: The thing not to be underrated is relations between the festival and the city of Newport. That was a huge factor in what did the festival in during the late ‘60s. Indeed, by 1970, ‘71, they were thinking about still having a Newport Folk Festival, but there were serious thoughts about having it elsewhere, still calling it the Newport Folk Festival but holding it in Providence, in upstate New York, in the Yale Bowl in Connecticut. Paste: Would that have been an effort to try to get a handle on the increased crowds, the new kind of demographic that was being attracted to a Newport show that, by the late ‘60s, was booking acts like Janis Joplin? Rick Massimo: It was to get a handle on the crowd, to have more space. And it was also because relations had so soured with the city. You have to remember, Newport, I think in the late ‘60s there were about 20,000 or 30,000 people living in Newport and the festival would bring a total of 70,000 people for three days. Jay Sweet: Newport was a little bucolic, pastoral town on the water. Rick Massimo: Newport is not the first place you’d think of to hold a festival that’s going to draw 70,000 people. Jay Sweet: Especially when it started, you couldn’t drive there. At one point you had to take a ferry because there wasn’t a bridge. We’re going to put it on an island. Paste: Was that at the time considered an attribute, putting it on an island? Jay Sweet: No, it was basically a wealthy woman. Rick Massimo: That’s who wanted to hold it. Paste: It was George Wein who seemed to get hold of the idea that a festival format—multiple performers on single days over a couple of days or more—could be sustainable for this kind of music. Rick Massimo: He wanted to give it a try. There were festivals of opera and classical music. Jay Sweet: George, by the way, is still my boss. He’s 91, or as he would say, he’s in his 92nd year. I say this and it may sound trite, but he didn’t write the book on music festivals; he created the printing press that made the books about music festivals. There is really nobody else that can claim to have in one moment, with one couple, created what is now, I would say, running the music industry. I think that festivals, that’s the thing that everything comes out of. “Oh, you have a new album. You have to play these festivals because that’s the way you’re going to be seen by all these people.” This was it. This was the inception. I always try to make sure that George gets the credit because some people forget that this one guy had the vision to do it. Paste: It’s taken on a life of it’s own from there. Jay Sweet: Yeah, well it’s taken over my life completely. It is beyond a profession at this point. I live and breathe it. Paste: Rick, I wanted to circle this conversation back around to a point in the book that seems like the fulcrum for this festival and its history: the infamous Bob Dylan performance in 1965 where he went electric and played with a rock band for the first time and freaked everyone out. There’s the popular perception that Dylan’s performance was met with scorn and derision both in front of the stage and behind it, but it seems from your telling that it was much more complex than that. What of that lore is actually true and what is pure myth-making in terms of that performance? 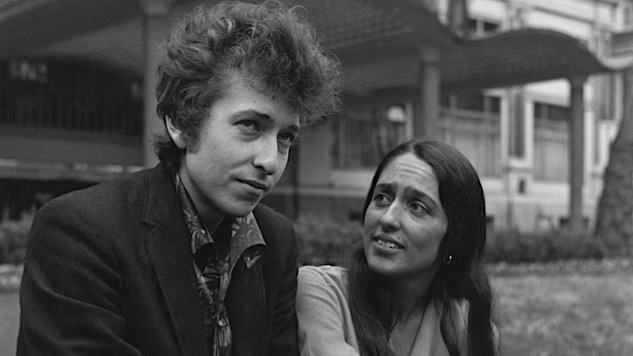 Bob Dylan and Joan Baez in 1965. Rick Massimo: As I sorted through all of the stuff—and this kind of became one of the templates for the book as well—I realized that there were all of these conflicts and all of these disagreements, including these internal disagreements. You have Pete Seeger saying he didn’t want to cut the cables to the sound system with an axe. Jay Sweet: He thought the sound was bad. Rick Massimo: You have Pete Seeger saying he did want to cut the cables with an axe. Paste: Right, he’s saying that no one could hear the words. The PA was overloaded. Rick Massimo: But what I was trying to tackle was that you have Pete Seeger saying he did want to cut the cables. You have Peter Seeger saying he didn’t want to cut the cables. You have Pete Seeger saying that he did like it, and that he didn’t like it. You have people saying nobody booed, and you have people saying, “Well, I booed.” After a certain point, I said there is no one story to tell here. The point is actually that folk music had been refracting and fracturing and this is where it really blew up. Eventually, I figured all I could do was point out that this was actually the story. Paste: There’s a funny line somewhere in that chronology where someone was saying that there was an axe available backstage. Paste: If he had wanted to get an axe, he could’ve just grabbed the axe. Listen to an exclusive recording of Joan Baez performing “Suzanne” at the 1968 Newport Folk Festival. Rick Massimo: They had the Texas prison singers who were chopping a log and singing their prison songs. That was one of the indigenous kinds of music that Pete Seeger wanted to present. Jay Sweet: Yeah, a lot of festivals bring a bunch of prisoners up from Texas with axes. Rick Massimo: That’s a common thing now. Jay Sweet: By the way, I’ve been trying to do that ever since—an all-axe band. Paste: In some ways, that Dylan performance, in all of its contradictions and all of its different stories, different mythologies, different memories, it almost encapsulates the history of the festival, what the music is, what it’s supposed to be, who it’s for, who gets to play it, all of it is included under this umbrella of Newport, and it all fits with that identity of the festival. Jay Sweet: We could have that today. Rick Massimo: Of course you could.